1. 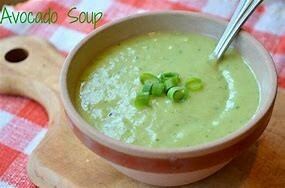 To make the soup, peel, destone and chop the avocado. Peel and deseed the cucumber, reserving a whole 3cm piece to one side. Trim and roughly chop the spring onions, then pick and roughly chop the coriander leaves. 2. Blitz the avocado, cucumber, spring onions, coriander, stock, yoghurt and green chilli in a blender until smooth. 3. Season with lime juice, Tabasco, and a good pinch of sea salt and black pepper, then cover with clingfilm and put in the fridge to chill.